Bring a huge variety of snack foods and cold, refreshing beverages to your Encinitas building today. Having food and drink onsite will immediately relieve the stress of hunger and thirst that could be afflicting your employees. 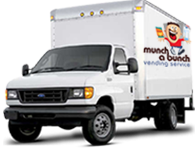 Get the products and service your employees in Encinitas want and deserve from Munch a Bunch Vending. Everything is refilled and continually cleaned at filled at no cost to you. It's a win-win. We bring healthy snack foods and drinks right to your building. Our products are available 24/7. Our vending machines, office coffee and water delivery and filtration services eliminate the need to leave the office to satisfy cravings. Our vending services in Encinitas increase productivity and morale by keeping employees at the workplace when they need food or beverages. This eliminates wasted time because no one is sneaking out for coffee, a cold beverage or a snack to stay refreshed and focused. 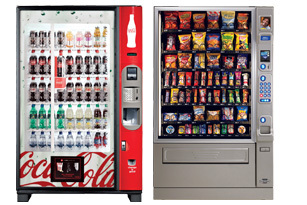 As a full service vending provider in Encinitas, we offer a host of name brand vended products for you to choose from. Munch a Bunch Vending lets you choose what is vended and we customize the equipment to meet your needs. We have several vending options including traditional vending, subsidized vending and free vending. If you have a large workforce, you may also choose to have a Micro Market at your Encinitas location. Everything is guaranteed to be fully stocked and available for use. We also do full filtered water plumbed in units. Give us a call at 760-480-0870 or email an account rep at mabvending@yahoo.com to find out more. You and your employees will be happier for it.